These homeowners faced a common problem. Their house was too small. But they liked where they lived and didn’t want to sell and move to a new house. 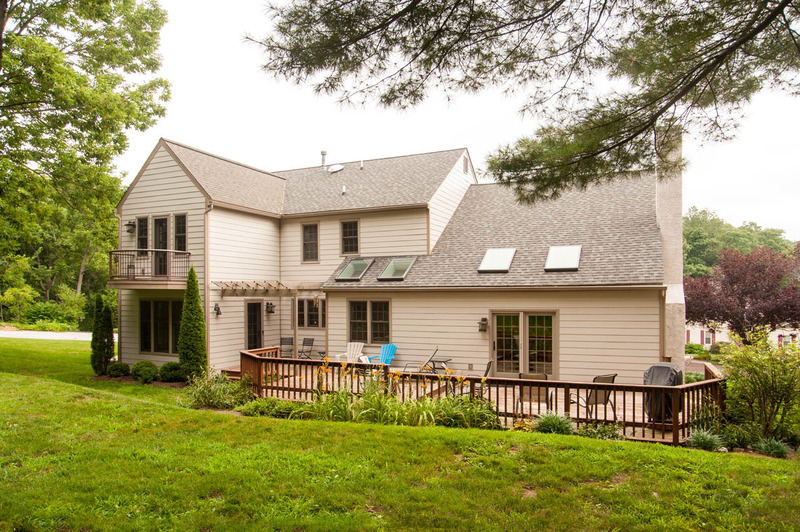 The solution was to add on and renovate their existing home. We designed a one-story addition for the north side and a two-story addition on the west side. This allowed us to create a new dining room, a larger kitchen with butler pantry, a home office, a kids’ playroom, and the larger master bedroom shown here. 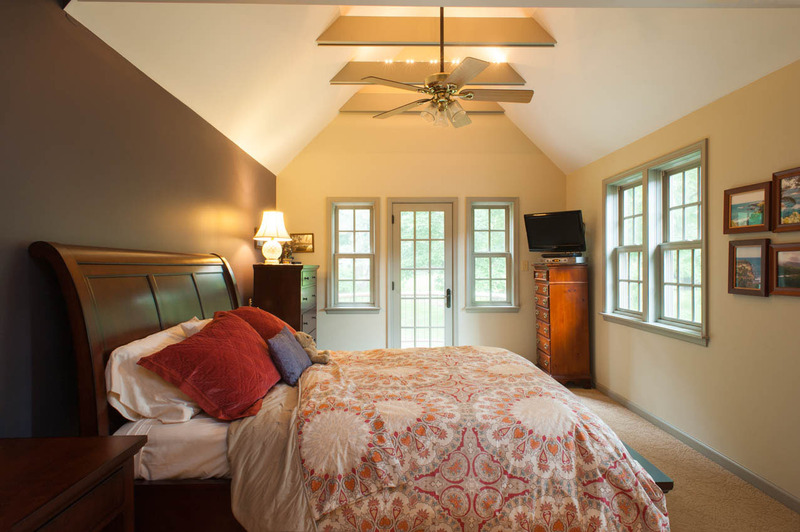 The new master bedroom accommodates a king size bed and has a private small deck overlooking the back yard, accessible through the new French door. Additional windows in the master suite fill it with natural light, while the angled ceiling gives a sense of spaciousness. The new two-story addition as seen from the backyard, doesn’t look like an addition at all. Exterior features were designed to match and blend with the older structure. The small second story deck off the master bedroom has a circular railing that creates a balcony effect. The new play area for the children is in the lower part of the two-story addition. 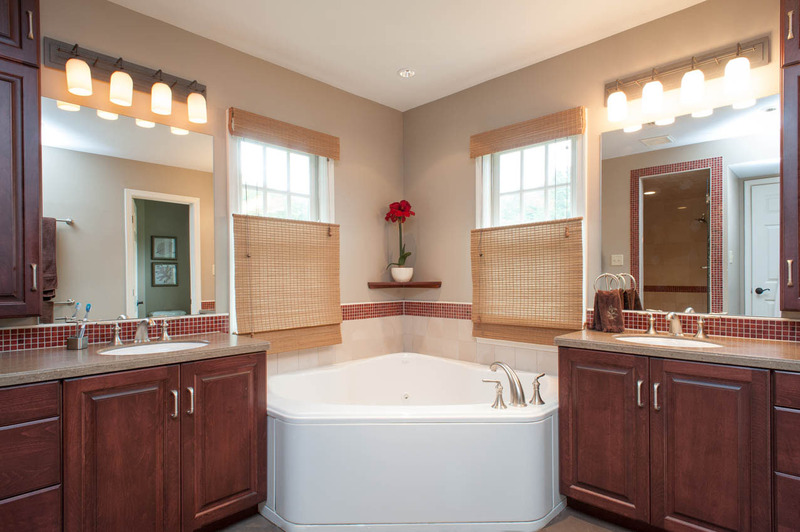 The new master bath includes his and her sinks and vanities. Between them the new whirlpool tub is an place for soothing relaxation. Warm tones in the walls and tile create an inviting ambiance, accented with the warm wood tones of the cabinets and drawers that provide ample storage space for towels and accoutrements. Blinds cover the lower half of the windows for privacy, leaving the top open for natural light. The new, larger kitchen is a spectacular gathering place as well as an enjoyable food-prep area. Floor-to-ceiling cabinets provide a huge amount of storage. There’s now room for a large refrigerator and new state-of-the art cook top and built in wall ovens. The darker warm tones of the raised panel cabinets are a rich contrast to the soft tone of the wood floor. 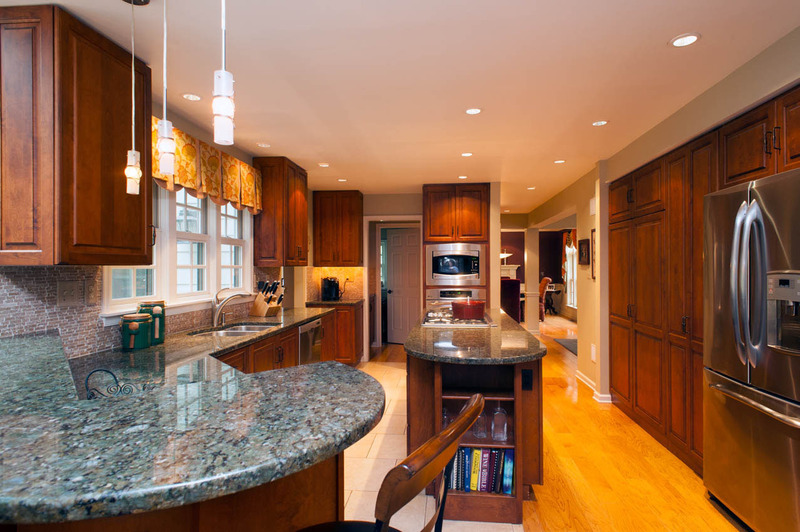 Countertop space is abundant with a center island and a bar. Recessed lights brighten the entire area while pendant lights add interest as well as light over the bar. Adjacent to the bar is a built-in booth for casual in-kitchen dining. The bench seats lift up to double as storage space. 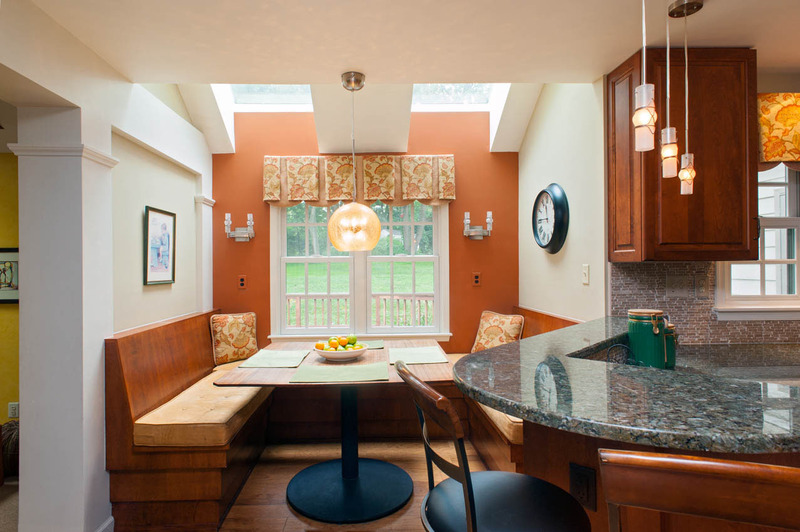 The warm tones of the kitchen cabinets are echoed in the wooden booths and the paint color of the dining nook wall. 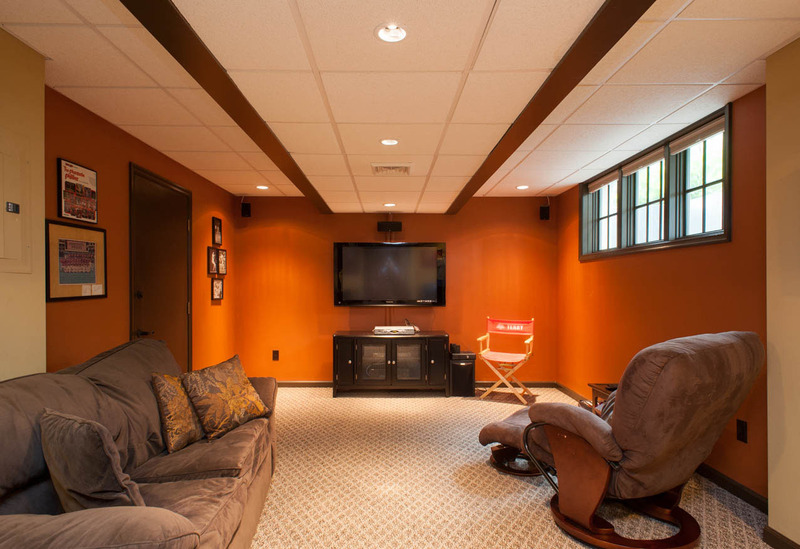 The warm tones of the house continue into the new basement family room under the dining room addition. The center of the ceiling is lowered to conceal pipes and ductwork, then finished with a dark edge that reintroduces wood tones into the basement area. High windows let in natural light and the door at the end of the room is an additional access to the yard.